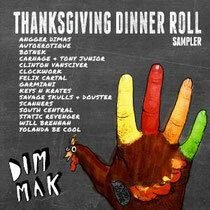 To celebrate Thanksgiving season, Dim Mak Records is giving away the Thanksgiving Dinner Roll [Sampler], a free, downloadable playlist of some of their biggest remixes of 2013. The playlist features remixes of numerous Dim Mak artists and friends, including Clockwork, Felix Cartal, Keys N Krates, Yolanda Be Cool, Angger Dimas, Autoerotique and more. 8. Angger Dimas "Jump Floor"